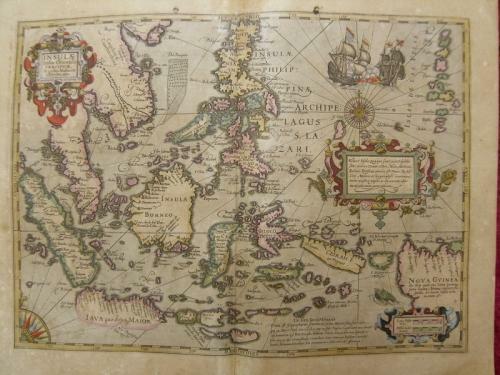 One of the most decorative maps of the Indonesian Archipelago, including the Philippines, Malaya and further India. Ships in the sea and a beautiful title cartouche add to the beauty of this map. The latter are thought to depict Dutch and Spanish vessels in the battle between Admiral van Noort and Dr.Morga fought in 1600 off Manila Bay. Reference:Quirino, Philippine Cartography, p.80: Clancy, The mapping of Terra Australis, map 5.13. In very good condition with overall toning and a centerfold reinforcement to the verso. A couple of small repairs to the margins. Would frame well and the faults are reflected in the price for what would normally be a GBP 2500 map.